Shangri-La Mactan Full Review - Is It Really The Best Luxury Resort? 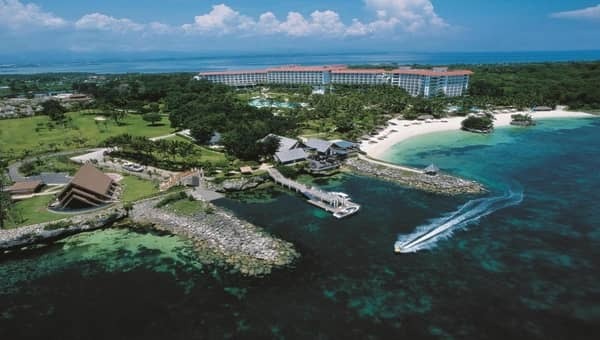 The Shangri-La in Mactan is one of the island’s highest rated beach resort. This comes as no surprise, as the Shangri-La network is known to be one of the best 5 star hotel chains in the world. These hotels are famous for providing extraordinary service, in a setting of luxury and leisure. While it is one of the most expensive resorts in Mactan, in return you get a full all inclusive experience like nowhere else. This specific Shangri-La in Mactan, has a more sportive and vibrant vibe to it. They designed the resort with nature and activity in mind, to create a peaceful haven where you can truly connect with nature. It lacks the luxurious vibe of Shangri-La Boracay, or the Urban sophistication of the Shangri-La At The Fort, but it makes up for that by having its own unique style. The Shangri-La is always a sure bet for everyone who isn’t dettered by the price. 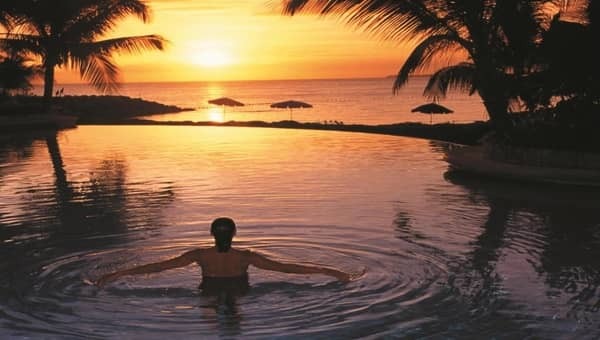 Here, you’ll get everything you need for a pampering all inclusive holiday. You will never have to leave your resort, as everything is provided on site, and at the highest standards imaginable. For that reason, we recommend the Shangri-La Mactan resort to anyone who prioritizes comfort and luxury – singles, couples and families can all find it enjoyable. This is a place where the attention to small details is exceptional. The staff and management are professional and friendly, and will do everything they can to please you. It's a huge resort though, so don't expect too much personal attention. Still, the overall level of facilities and the amount of extra services and activities make this a world class resort. The design is somewhat basic for a luxury 5 star resort. The place does look a bit run down and could use a small facelift. In that regard, we'd have to say its by far the least impressive Shangri-La we've been to. 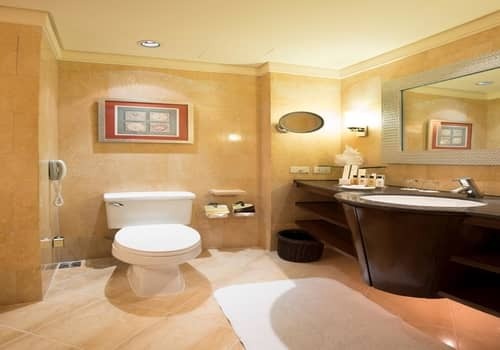 That said, the level of all facilities is extremely high – they are clean, well equipped and properly maintained. The rooms at this resort are nice and spacious, but they are actually slightly smaller than those at other luxury resorts in Mactan. They are however, extremely well stocked and furnished. Everything is new and well kept, the design is luxurious and the amenities are all of very high level. One of the hotel's strongest point, especially compared to other resorts on the island. The main pool is huge, and there are also 2 other, smaller ones around the resort. Shangri-La's private beach is also pretty good in Mactan standards, and their house reef is fantastic. 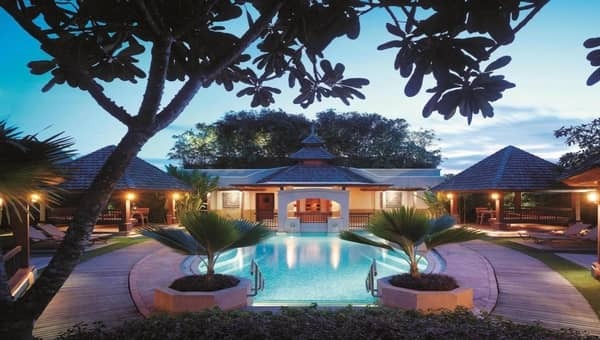 As with all Shangri-La resorts, they opt for a more remote location to strengthen the feeling of exclusivity. Still, the resort is only 15-20 minutes drive from the airport, and has enough stores and bars next to it, so you don't feel stranded in the middle of nowhere. The value of staying at any Shangri-La comes from their consistency and overall high quality. This place is intentionally designed to cater to people who care less about the cost, and want to enjoy the best resort experience possible. In that regard, the Shangri-La Mactan definitely delivers and will meet your expectations, no matter how high they are. The Shangri-La is actually located right next to the Mövenpick Resort, another high end 5 star hotel, and we came to it just after staying there. So, we came with really high standards and were curious to find out why exactly does the Shangri-La charge so much more. 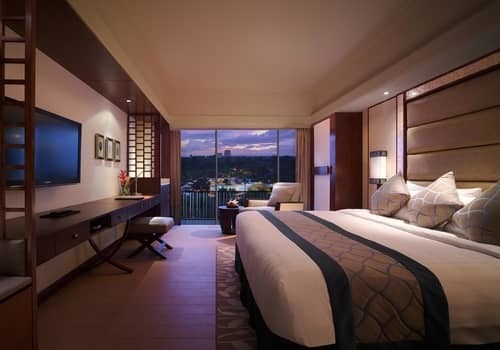 At first it felt a bit underwhelming, as the resort’s design feels a bit rustic compared to the modern look of traditional luxury hotels, such as the Mövenpick for example. The thing which separates the Shangri-La from other hotels is that everything they do is grandiose on purpose. The entire hotel just feels supersized, from the pool to the restaurant and all other facilities. This is further strengthened once you get to the beach area – a very wide and beautiful strip of white sand. The house reef is the largest among Mactan resorts, and also offers the best selection of marine life – so it’s a perfect place to snorkel or dive at. A lot of the nearby resorts, even the Mövenpick, actually organize tours for their guests taking them to the Shangri-La’s reef, which really tells you the whole story. 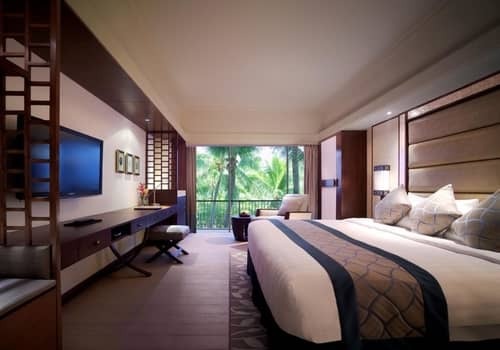 The Shangri-La Mactan Resort is also by the far the largest when it comes to the sheer amount of rooms. There are no less than 530 rooms in the property, which is more than double than any other hotel on the island. Luckily, the service is so good and the hotel is spacious enough that you don’t feel too crowded. Still, combined with outside guests visiting the reef, pool and restaurants, often you might find yourself waiting for something. All in all, this resort isn’t ideal for people who prioritize their privacy, or for those who want an extremely personal and quick service at any given moment. The resort is divided into two main sections: the Main Wing and the Ocean Wing. The first is where most rooms are located (354 out of 530) and it offers a central location close to the pool. The ocean wing on the other hand is more private, with a direct access to the beach, as well as a separate lobby and parking area. Rooms at the Ocean Wing are slightly more expensive, but they also grant you with access to the executive lounge. The benefits of the Ocean Club include a separate breakfast area, express check in/out, free cocktails and drinks all day long and many other small indulgences. For couples, especially honeymooners, we recommend spending a little bit extra to enjoy a more luxurious stay, and most importantly a much more private and relaxing one. 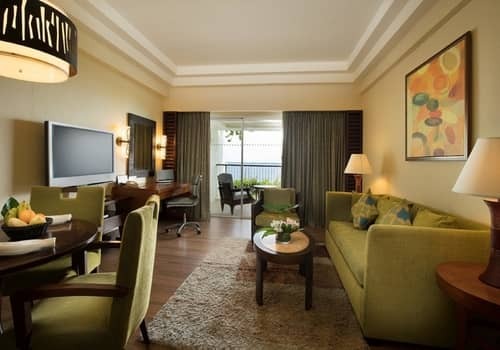 The rooms themselves are equipped with everything you would expect from a luxury resort. WiFi is working great, and the shower as fantastic pressure in it and the water are always hot. 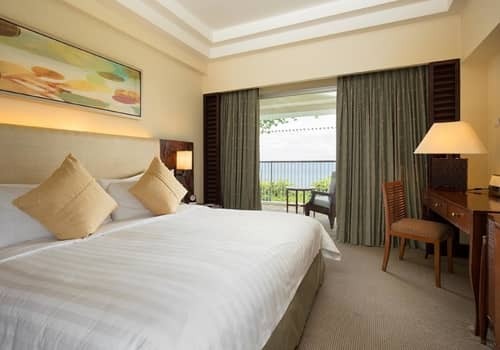 The main highlight for us was the bed – which provided the most comfortable sleep we had in Mactan. 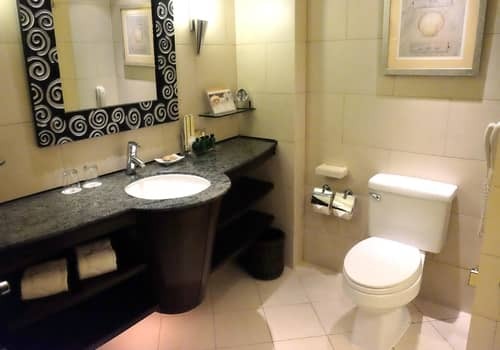 Toiletries are also of the highest level imaginable, and they are replenished whenever you need it. While not huge, they are all large enough to comfortably accommodate a family of four. 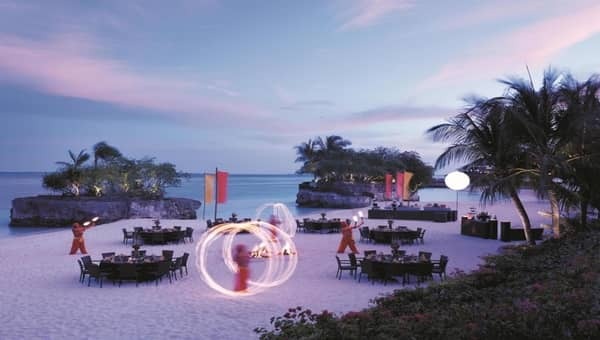 Do Guests Like the Shangri-La Mactan? Trying to compare between 5 star resorts can be tricky. Since they all provide a wonderful experience, sometimes it really takes an effort to gauge the small differences which separate them from one another. This is especially the case when it comes to a Shangri-La hotel, where expectations are so high to begin with. We try our best to be objective and realistic in your assessment, to provide you with the most accurate information to help you pick where you stay. Tripadvisor.com has 3700 different comments from guests, with an average score of 4.5. No less than 90% of them rated their stay as either 4 or 5 stars, making Shangri-La the 2nd best rated hotel in Mactan. The top ranked resort is the Abaca resort, which is a boutique hotel – more expensive but a much nicer choice for couples who want privacy amidst a luxury setting. People from tripadvisor really liked the Shangri-La's pool, restaurant and spa. On the other hand, the most common complaints were about the price, and the rooms being a bit old. We also found 1047 reviews on Booking.com and 1703 on Agoda, with average scores of 8.8 and 8.7 respectively. Again these scores are a bit higher than all other 5 star resorts, with the exception of Abaca. At both sites, people really praised the all inclusive nature of the resort, as well as the green surroundings and nice beach. Again, we noticed some complaints about the rooms being too small and in need of slight renovation. People also complained about the price, and rightly mentioned this resort is great, but not as good as other Shangri-La hotels. 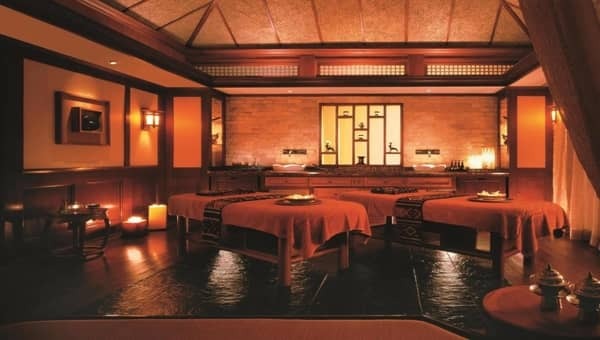 The thing which really sets the Shangri-La apart from its competitors are its fantastic facilities and extra services. Combined with the sheer size of the resort, it helps create the ultimate all inclusive feeling to your vacation. 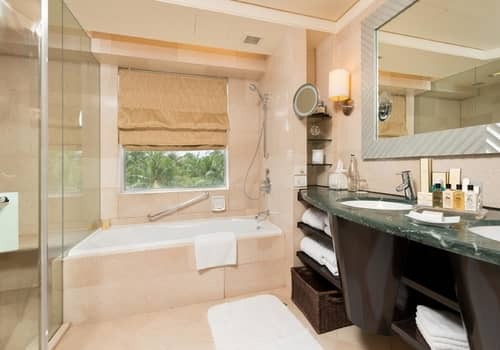 For us, the only other 5 star hotel which can even come close to that is the Plantation Bay Mactan Resort, which is a great luxury resort but still comes short when compared to the Shangri-La’s in terms of all inclusiveness. Chi spa in particular, is considered the best in all of Cebu Island, and has won numerous awards. Dining options at the Shangri-La are also extremely diverse, with everything being at the highest standards. There are 4 restaurants – Italian, Chinese, seafood and mixed contemporary cuisine. The latter is served at the Tides restaurant, the main dining venue on site. This is also where you’ll get your breakfast, served as a buffet, which is probably the best breakfast anywhere in Cebu. 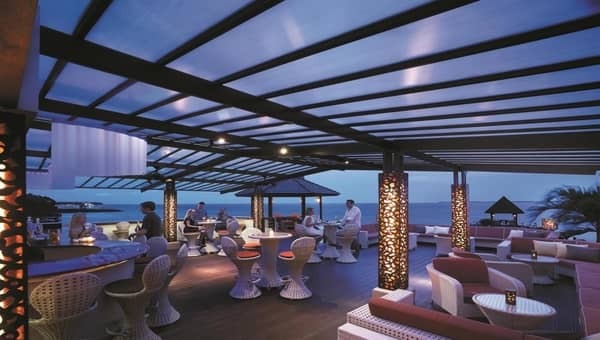 The 2 bars are located at the lobby and by the pool, and they serve drinks and light snacks. The lobby lounge is open until 1am, while the pool bar (named Buko Bar) sadly closes very early, and is open until only 7pm. There’s also a large kid’s playground, and an entertainment center for adults which offers games and recreation. On top of that, numerous activities are organized by the resort on a daily basis, most of them complimentary. 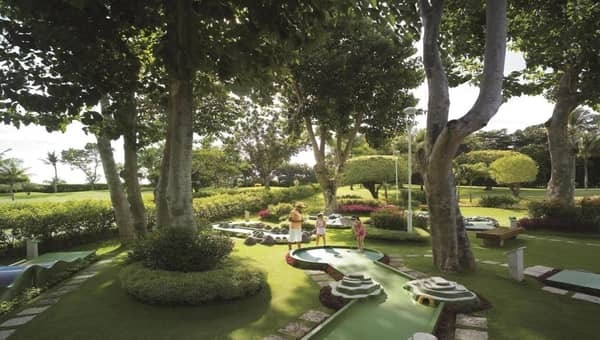 True to the resort’s agenda of being a sporty and vibrant nature resort, most activities are of that nature. The most popular activities include yoga, Pilates, tennis games and lessons, snorkeling safari at the house reef and a personal training session at the gym. Children have their own unique activities, with the swimming and snorkeling lessons being a particular highlight. One last thing worth mentioning is a derivative of the resort’s size, and insistence on being young and vibrant. The new management have banned the use of carts, insisting that guests should walk and remain active while staying there. That is all nice and fine, but the Shangri-La sprawls over a huge piece of land. To make matters worse, you have to climb quite a few stairs when you tour around the estate. That means the Shangri-La is poorly accessible and isn’t a good choice for senior or disabled people. If you are concerned by this fact, we wholeheartedly suggest you book the Crimson Resort in Mactan instead. This wonderful 5 star resort is much better suited for families, as well as people of all ages since they have 100% accessible rooms and facilities, especially designed for people with disabilities. In conclusion, the Shangri-La is always a sure bet. World class standards are reflected through its service, the rooms, facilities and dining experience. The only 5 star accommodation that exceeds the Shangri-La’s standards of luxury is the Abaca resort, which is more luxurious private and romantic. 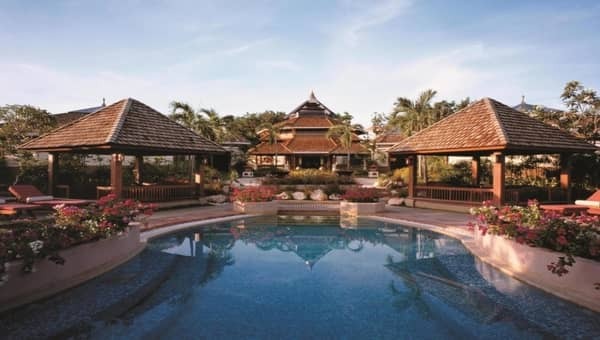 Shangri-La’s main advantage however, is its larger pool and considerably better beach area. 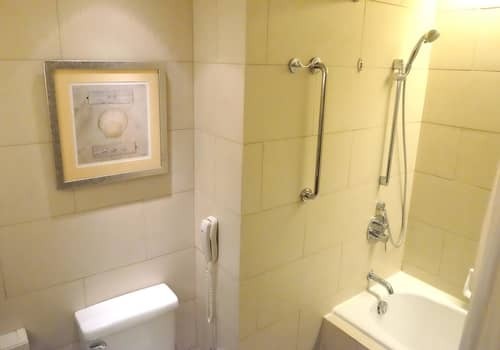 These 2 hotels are also considerably more expensive than any other 5 star resort in Mactan For people who want nothing but the best, and are willing to pay for it, there aren’t many better choices in Mactan. The Deluxe is the most basic room category available at the Main wing. 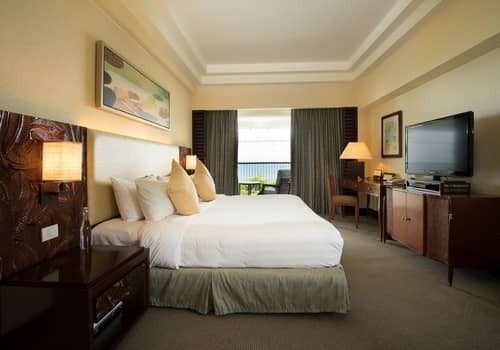 The room is 34m2 and comes with either a king size or 2 queen size beds. 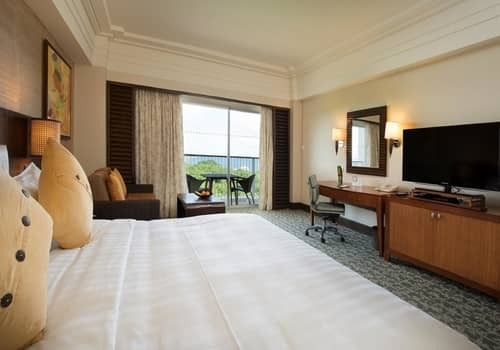 There’s an option to upgrade the room to Deluxe seaview, which is the same size but offers a better view from the balcony. Then there’s also the Deluxe Family, which is almost double in size – it has the same bed setup but much more space for everyone. The Premier room is basically the Ocean Wing version of the Deluxe room. With 34m2 of space and your choice of either 1 king size or 2 queen size beds, it can comfortably fit in 2 adults and 2 children. 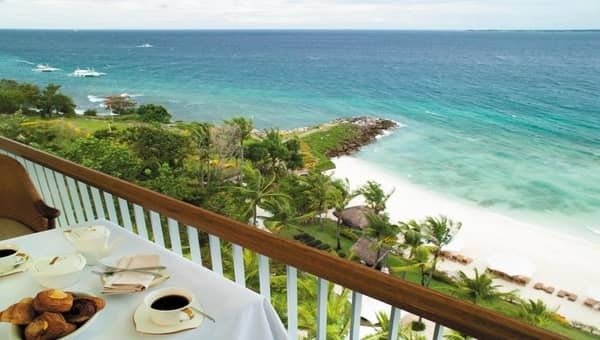 From a small fee, you can upgrade to the Panorama version – which is slightly larger and offers an unobstructed view of the ocean from its balcony. 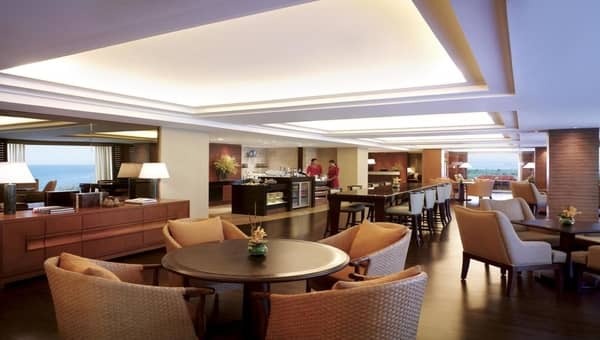 There are no less than 4 different suites types at the Shangri-La, all providing access to the executive lounge. The most popular choices are the Panorama suite at the Ocean Wing (72m2), and the Main Wing Mactan suite which is roughly the same size. Both offer a living area and a private balcony, and can accommodate up to 3 adults and 2 children under the age of 11. The main wing also has the Veranda Suite, which is similar to the Mactan suite only it has a huge 30m2 terrace overlooking the ocean. 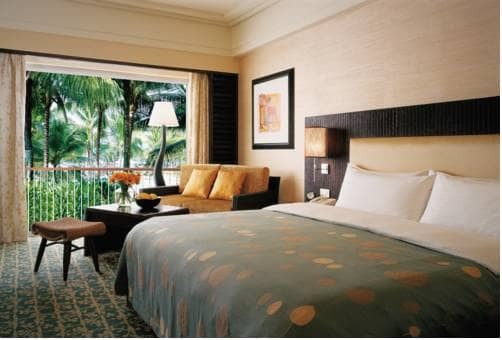 Then there’s also the Shangri-La suite at the main wing, which is 136m2 and is the best room at the hotel.